Even the World’s largest brands struggle to find, recruit and retain the best-of-the-best employees. Just like their brethren in marketing and social media, HR can greatly benefit by transforming their biggest fans - their employees - into brand advocates that help them achieve their recruiting and retention goals. Differentiating and communicating the true value of company culture to top tier candidates. Lack of budget and time to develop photo or video content that would truly attract candidates. Implementing programs that help employees feel connected to evangelize their company brand. Thismoment Content Cloud provides an innovative recruitment marketing solution that allows employees to actively engage in the conversation by submitting their photos or videos of the workplace via any mobile device. Employers can easily use this employee generated content (EGC), mixed with branded content, to create authentic marketing materials to attract new talent in a competitive marketplace. Content Cloud makes it easier to create, deliver, and manage EGC talent attraction and retention experiences across all platforms. 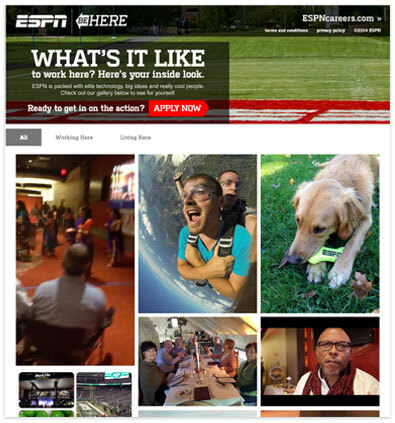 ESPN invites their employees to share the benefits and perks of working at ESPN, showcasing authentic EGC to prospective candidates.